Controlling how we use and aim our eyes together is an importing skill that keeps us from seeing double. The ability to use both eyes as a “team,” or a single functioning pair, is what allows our brain to fuse the two separate pictures coming in from each eye into a single image with depth perception. This skill is called binocularity, or binocular fusion. Some people have difficulty aiming their eyes together, especially when looking at small images at close ranges, such as reading print. This is why eye teaming problems are especially difficult for school-aged children. 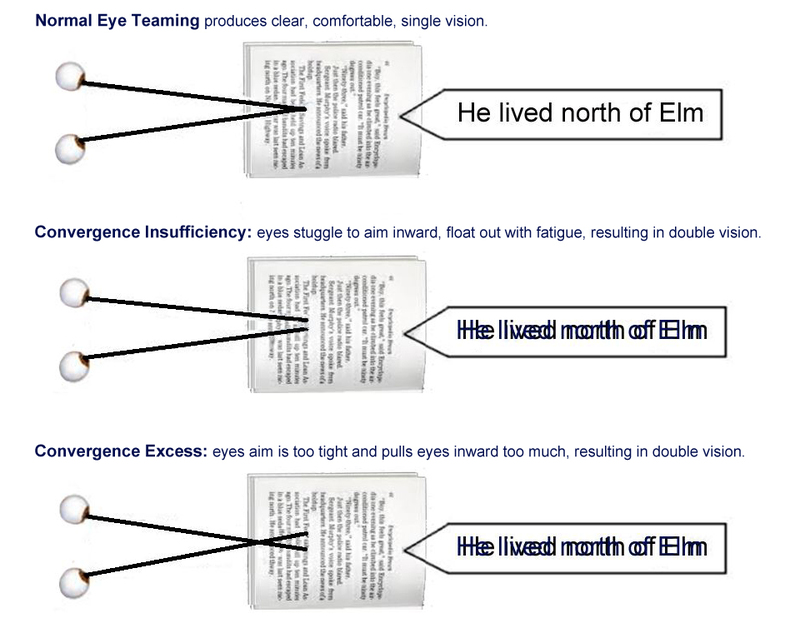 As they fatigue from the strain that small print places on their visual system, they lose the ability to aim their eyes at the exact same point. If the images each eye is recording are different enough, the brain can’t fuse them, and the result is double vision. Not all children see double, however. In order to avoid double vision, the visual system will often suppress an eye, that is, “turn off” one eye by blocking the image from reaching the visual cortex in the brain, but the effort to turn off an eye is exhausting and causes the child to lose concentration. If the child doesn’t stop reading, he’ll soon become too tired to suppress and will then start to see double. Other times, the visual system tries to compensate by using the focus system to help lock eye aiming in place. By focusing too much, children can keep their eyes aimed together for a short while longer but the result is blurry vision and headaches. Most children stop reading long before they see double or get headaches. This is why eye teaming problems can look like attention issues. Because they have to stop frequently to rest their eyes, these children are often misdiagnosed with ADD. 1. The ability to turn our eyes inward to maintain single vision when looking at objects up close is called convergence. Children who struggle to aim their eyes inward may have a visual deficit called convergence insufficiency. Their natural eye aim is in a relaxed, outward position, making it more difficult for them to comfortably aim their eyes inward for long periods of time. As they fatigue, their eyes tend to float outward and aim slightly behind the target. When this happens, the child will either see double, suppress an eye to maintain single vision, or stop looking at the target altogether. 2. The ability to turn our eyes outward to maintain a single image when looking at distant objects is called divergence. Children who struggle to relax their eye aim tend to aim inward too much, and they may have a visual deficit called convergence excess. Their visual system is too tight. 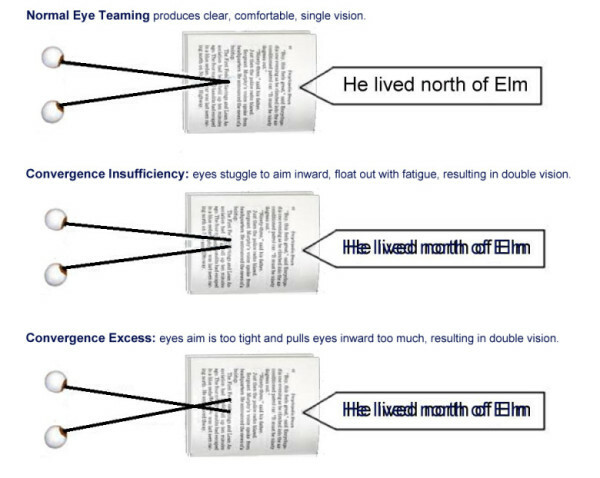 When looking at near objects like print during reading, their eyes fatigue and return to their natural inward position. When this happens, the child’s eyes are aimed in front of the target, and he will either see double, suppress an eye to maintain single vision, or stop looking at the target altogether. This page is still in development. Parents: If your child has difficulty with these activities, it could indicate he/she has an undetected vision problem. Talk to your family eye doctor or contact a developmental optometrist for further evaluation. To locate a doctor in your area, go to covd.org.